This mini-series is the final segment of the trilogy following Two Girls, One Tank and Gold. With a few bars of gold left, and Sub Girl’s uneasy feeling that she left something behind, Tank Girl hires her scientist friend to reinvent time travel. The Third Reich have no idea what is coming their way! 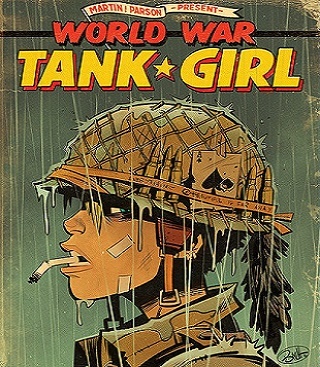 Alan C. Martin one of the original creators of Tank Girl (with Jamie Hewlett) for British publication Deadline Magazine is still on board. Brett Parson is now the artist in chief, he illustrated the other editions of the trilogy and previously worked on New Romancer. There will be covers designs by Chris Wahl, Keith Burns, Shaky Kane and Brett Parson. Titan comics will be publishing Tank Girl: World War Tank Girl #1 on February 15, 2017.